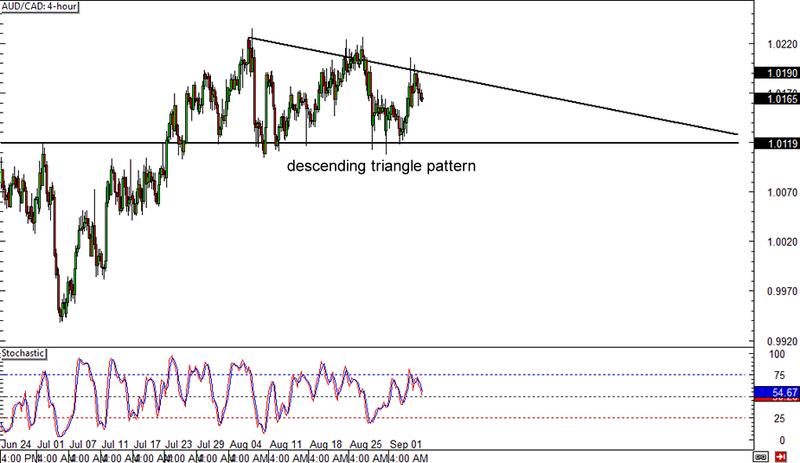 First up, here’s a simple triangle pattern forming on AUD/CAD’s 4-hour forex chart. Price has just tested the top of the descending triangle and may be moving lower, possibly all the way down to the triangle support near the 1.0100 major psychological level. Stochastic is moving down from the overbought zone, indicating that Aussie bears are in control of price action for now. A stronger selloff might even lead to a break below the triangle bottom, which might then lead to a 100-pip drop, which is the same height as the chart pattern. If the triangle support holds though, another test of the pattern’s resistance might happen. 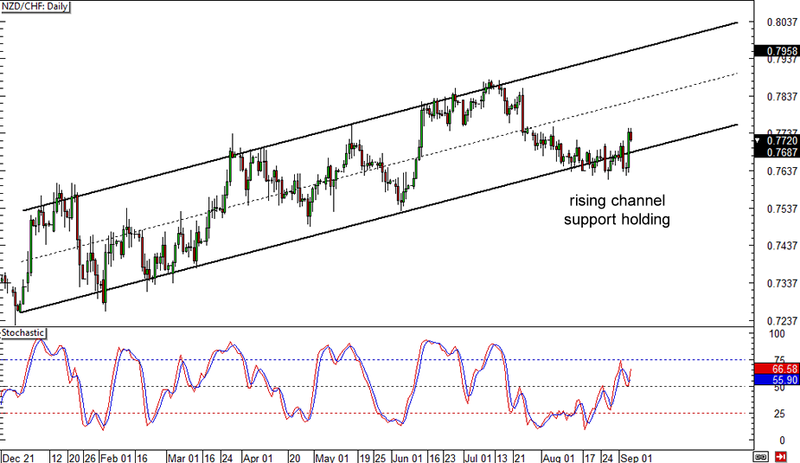 Looks like NZD/CHF’s rising channel support is holdin’ like a boss! The uptrend still seems to be intact for now, as price recently broke out of short-term consolidation at the bottom of the forex channel and indicated momentum in moving higher. Stochastic is giving the same signal, as the oscillator is also climbing. With that, NZD/CHF could make its way up to the top of the channel near the .8050 minor psychological level or at least until the mid-channel area of interest at the .7900 major psychological mark. Make sure you set your stop below the channel support if you’re planning on going long! 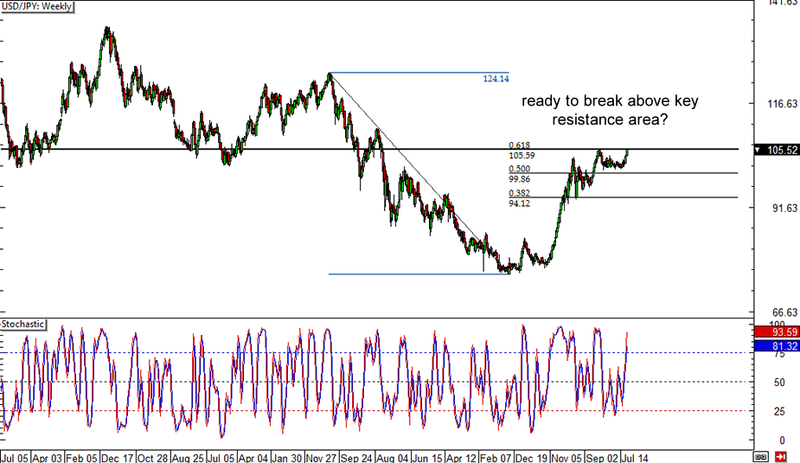 I don’t always throw in a weekly forex chart but, when I do, it’s because a breakout might take place! As you can see from USD/JPY’s weekly time frame, price is currently testing the last Fib level on the latest downtrend, which lines up with the previous year’s highs and a long-term area of interest. A convincing upside break from this level would be a sign that the pair could head much further north, possibly until the swing high near the 124.00 handle. Stochastic is barely in the overbought area, indicating that a bit of buying pressure is left and might be enough to push USD/JPY higher.